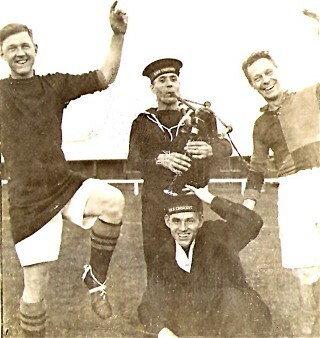 Sailors and Footballers enjoying themselves in the Recreation Ground. The sailor in the middle foreground is from HMS Crescent and it maybe that the piper is from the same ship. Anyone recognise the two footballers -they maybe from the same ships or maybe locals. The date of the photo is not known. Hello John. Many thanks for adding these wonderfull pics to the site. Elsewhere I made an enquiry about a professional photographer known as "Duguid" who used to attend all events in Inverg. Given your middle name, are you a relative? If so, have you access to a large archive of photos? Hello, Bill, Glad you liked Duguid's pictures, but I'm afraid there has been a misunderstanding. All that remained of Duguid's photos were rescued by my mother when Duguid's sister died. I posted them on the Invergordon off the Wall website and have a few more to put on. Some are quite faded and take a bit of touching up but they should be on our website shortly. Keep a look out. You must remember Duguid; you are about ages with me; he was a small man, his head always tilted to the side. As far as I remember his sister was his only relative. I think you will find that the majority of the photos attritubed to the heritage centre were Duguid's. By the way, I'm Noreen Kelman (Nonie's daughter). Hello Noreen, nice to hear from you. I remember Duguid very well. I seem to remember he had some kind of spinal deformity and he used a large plate camera, which along with his tripod was almost as big as himself. I think he did photos for the Ross-shire Journal and other papers and was always to be seen at any noteable event in town. I am sorry to hear that a lot of his stuff has been lost as no doubt it would have provided a fantastic archive of pics mostly from the 40s & 50s. With your married surname I can't resist asking if you are related to my first wife's family? Are you still in Inverg? Hello Bill, thought you would have remembered Duguid. I don't really think that a lot of his photos were lost, just that most of them have not been attributed to him. I know I have a small book of photographs 'Picturesque views of Invergordon' published by John Ross, 35 High Street (Strachan's old shop). They have all been used by Park School and are attributed to them. They are also on this site and the Invergordon off the Wall site. I'm not sure who the photographer was as I think they were possibly before Duguid's time and he always signed himself John Duguid Ross. I think John Ross's shop was a newsagents and maybe he was a photographer as well, as the photos would seem to be about the early 1900s. Anyway I'm still in Invergordon, have Johnny Boyd's old shop and my husband came from Elgin. I'm not sure where your first wife's family came from. By the way, where are you based now, and Audrey who was in school with my sister Mary?